Looking upwards from the ground to the Transporter Bridge, Middlesbrough on Sunday! This is Lisa, the daughter in law of our good friends Dorothy and Keith Askew. On Sinday Lisa did a bungy jump to raise funds for MacMillan Nurses. We went along to support her! Well life is certainly very busy in the Nesbitt household. Just returned from a visit to Huddersfield re Jon's business and are up early tomorrow to travel down to Liverpool for another meeting. On Friday I am travelling over to Darlington re Jon's business again. meanwhile, back at the ranch, I am making prearations for a trade stand in Bradford on October 18th as well as organising a Wedding Fayre for the following weekend. I am currently preparing samples for a wedding commission, my first booking for 2010, january 21st so things need to be kicked into action. I am also doing the flowers too! I am just ordering some dried flowers for this so watch this space. Oh and there are 90 place cards and 55 orders of service to make by next weekend! Lots to keep me out of mischief! lol! My second time with this fun project! She looked into the deep blue eyes, searching for clues. The eyes held her stare, penetrating into the very marrow of her bones. Alone in that room she was rooted to the spot. Panic was rising in her stomach! She had to turn away..
close the bathroom cabinet door and get her but into action! Jo is male, a gander. He is a goose, about 15 years old. He is not viscious, but he is a good guard. He honks when he hears the motorbike, he can distinguish the sound of ours, possibly because it is a Honda and he knows his japanese bikes. He also knows the sound of our cars and always greets us with a honk! The picture you see in my profile is not Jo, but one of his former loves, Peggy. This was an oil painting I did one day when Peggy decided to pose for me outside the kitchen window. I had never used oils before and was finding it difficult. When she stood there I knew it was something I could paint as I knew the subject so well, unlike the flowers in the text book I was following. No sooner had I finished, Peggy walked away. I did not add anything more to the picture, I felt I had captured her just right...the big blue eyes always staring through the window and the long orange beak. Jo was named after Jon's grandad. Peggy, after Jon's grandma and Dolly after my nana. Sadly Peggy and Dolly are no longer with us and Jo is a widower. He leads a very content life, his eyesight isn't too good as he has cateracts so he is familiar with the garden and paddock. He dislikes the church bells and honks away when they are rung on a Sunday. Anything I have missed out, please shout up and myself or Jo will answer any further questions. Labels: ABC Wednesday, Jo my faithful gander. of what will be their new home in a few weeks time! Here you can see mabel on the left. She is the one who has a rebellious side to her nature! and spent the morning strutting after Jo the gander! the brown one to her right is Olwyn. They continue to eat well, layers pellets, wheat etc but they are particularly fond of elderberries! I managed to video a whole 16 seconds before my camera packed in! Notice too the 2 light brown ones. Not one is dissatisfied, not one is demented with the mania of owning things. Yes, a very important part of my world. 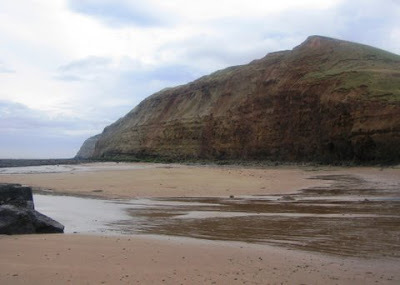 I often take wilma a few miles up the road to Saltburn beach, a place we often went when I was a child. I have many many happy memories of building sandcastles whilst mum and Antie Dot sat and chatted about everything and nothing! This morning I read Weaver's excellent poem with the title of "My Home Town! This got me thinking about what I would write, so this afternoon when we went out on the motorbike to Whitby I started playing around with some words. Arriving home I continued to think about it as i cleared out the henshouse, put the hens to bed and finally put Jo into his shed. this was the 60’s you see our neighbour was a hippy! Eric was her new husband and in his yard kept ferrets! she whipped down the curtains and made a dress for a dance! we’d have egg tomato sandwiches, Mum, Auntie Dot and me. it was an Austin 30 but we didn’t go too far! but on a blue motorbike we tootle over the moors. bring back my childhood memories a good thing, you must agree! Following on from my senior moment I decided I need to keep my brain active. I have read about this Friday project for sometime now over on Akelamalu's blog. Basically you have to write a story using just 55 words, so here is my first attempt! If you do have a go, make sure you let Mr Knowitall know, as this is his baby! She had tried to look away from the old wooden door. In a bid to escape the consuming urge to open it she made her way down the stairs, knowing she would return! The clock ticked, a time bomb inside her skull. This was the view from our cabin window as we returned home from France. Judging by the sunset, it was taken just as we were approaching the North East Coast. As we travelled up the coast it was really great to pick out landmarks surrounding our area. Like so many people although I love travelling and touring, the journey home is always the best. We did have a great time, a proper adventure which is just the way we like to do holidays. We can not plan the weather or routes, we just go with what we find. It is good too, that we both have the same attitude. Jon and I share so much of our life together and as we travelled home I was thinking about the new projects which were waiting for us back at home. This filled me with excitement and a buzz!and true appreciation of a happy marriage. I knew that I had come at last home. Wave-tossed, night-caught, long being lost. And natural as sleeping or waking. Who had never been wholly myself. And laughing easily at last. And time was not measured by clocks. In an effort to keep myself organised and to prevent unecessary faffing about with keys, purse and mobile, I bought myself a little bag, just big enough to hold the three key items of my everyday goings on. Jon is a key security conscious individual, I on the other hand lack the organisation required to carry out such a well defined role. Yesterday we had to travel to Huddersfield and York re Jon's business. "Your purse in on the kitchen table!" Jon informed me. Great stuff! All I needed was cash/cards to buy lunch. I was aware that I had not seen my bag for 24 hours, but I knew I had had a conversation on my mobile so I wasn't too worried. "Have you got your phone?" Jon asked....I told him I hadn't but I wasn't worried due to the conversation thingy! Last night, on our return home I decided to have a quick look, but found nothing! As I let Wilma out for her evening stroll around the garden I used our home phone to ring my mobile. In the dark, on the patio I could hear it ringing, so I toddled off to bed, somewhat reassured. but I couldn't find the keys. I phoned Jon at the workshop and asked him if he had noticed the pick up had been left unlocked, locked it not knowing my bag was inside containing keys & phone. "Quite possibly!" Was his reply. We have spare keys so using these I unlocked the pick up and had a good search! Came back into house & called my mobile from the house phone. Once again I could hear it. I walked round the house, drive and finally the garden. There was the sound coming loud and clear......from the area next to the chickens! I followed the sound and sure enough, there in the branches of the sycamore was my bag containig my phone and keys. I remembered, on coming home Mabel, the wayward hen had escaped and I had gone over to urge her back to the safety of the chicken run! Putting my bag in a safe place to allow me to deal with the situation! Another typical day in the Nesbitt household, where, it doesn't matter if you are crazy but it sure helps you fit in with everone else! Eventually I will get everything sorted here on my new blog! I was talking with my best friend Maria this morning and was telling her all about the problems I was having with my previous blog! Thing is, my blog is a place where I ramble on, just like Maria and I do when we get together, even pausing for air now and again. But my previous blog would not let me post...no everything was all jumbled up and not clear, so after I had rambled I then had to edit, justify etc etc and this annoyed me, because when I had done everything Blogger wouldn't carry out my corections. Imagine rambling on to a friend then saying, hang on, I can improve that last sentence, or oh was that correctly put? Well enough is enough! This is my new blog and I am so pleased to be here! ABC Wednesday, a wonderful opportunity to share my new place...my very own space! lol! One of the really exciting aspects of my wedding stationery business is the constant challenges I find being asked of me. Recently Katie and Andrew asked me to design and make a seating plan which would have the WOW factor! Well here is the result! 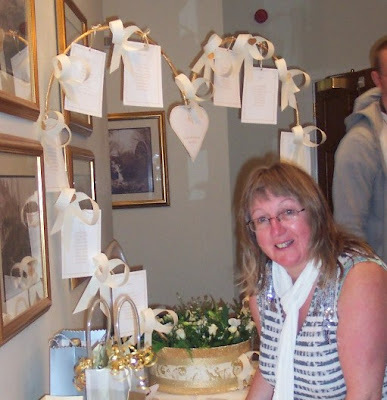 The responses I received at the Evening Reception certainly encouraged me to develop this into another service I can offer and indeed I have designed 3 more to be launched at the next Wedding Fayre I will be exhibiting at on October 18th! My World.......thanks to so many! Whilst we were staying with Dorothy we visited Oradour, a small village not far from St. Christophe. It is a village which was brought to the ground in 1944. Around 2 p.m. on 10 June 1944, four days after the Allied invasion of Normandy, approximately 150 Waffen-SS soldiers entered the tranquil village of Oradour-sur-Glane in the Limosin region of south central France. For no apparent reason, Hitler's elite troops destroyed every building in this peaceful village and brutally murdered a total of 642 innocent men, women and children, an unexplained tragedy which has gone down in history as one of the worst war crimes committed by the German army in World War II. On that beautiful Summer day, the defenseless inhabitants of Oradour-sur-Glane were rudely dragged out of their homes, including the sick and the elderly, and ordered to assemble on the Fairgrounds on the pretext of checking their identity papers. After all had been assembled, they were forced to wait in suspense with machine guns pointed at them. Then the women were separated from the men and marched a short distance to the small Catholic Church, carrying infants in their arms or pushing them in baby carriages. The men were then ordered to line up in three rows and face a wall that bordered on the Fairgrounds. A short time later, they were randomly divided into groups and herded into six buildings: barns, garages, a smithy, and a wine storehouse. Around 4 p.m., a loud explosion was heard which was interpreted by the men to be a signal for the SS soldiers to begin firing their machine guns. Most of the men were wounded in the legs and then burned alive when every building in the village was set on fire at around 5 p.m. By some miracle, 6 of the men managed to escape from one of the burning barns and 5 of them survived. They testified in court about this completely unjustified German barbarity against blameless French civilians. The Oradour church only had a seating capacity of 350 persons, but 245 frightened women and 207 sobbing children were forced inside at gunpoint while the men were still sitting on the grass of the Fairgrounds, awaiting their fate. The women and children were locked inside the church while the SS soldiers systematically looted all the homes in this prosperous farming village. Then around 4 p.m. a couple of SS soldiers carried a gas bomb inside this holy place and set it off, filling the church with a cloud of noxious black smoke. Their intention had been to asphyxiate the women and children in the House of God, but their plan failed. As the women and children pressed against the doors, trying to escape and struggling to breathe, SS soldiers then entered the crowded, smoke-filled church and fired hundreds of shots at the hapless victims, while other SS men stood outside ready to machine-gun anyone who attempted to escape. The soldiers fired low inside the church in order to hit the small children. Babies in their prams were blown up by hand grenades, filled with gas, that were tossed into the church. Then brushwood and straw was carried into the stone church and piled on top of the writhing bodies of those that were not yet dead. The church was then set on fire, burning alive the women and babies who had only been wounded by the shots and the grenades. The clamour coming from the church could be heard for a distance of two kilometers, according the Bishop's office report. The fire inside the church was so intense that the flames leaped up into the bell tower; the bronze church bells melted from the heat of the flames and fell down onto the floor of the church. One SS soldier was accidentally killed by falling debris when the roof of the church steeple collapsed. Only one woman, a 47-year-old grandmother, escaped from the church. Taking advantage of a cloud of smoke, she hid behind the main altar where she found a ladder that had been left there for the purpose of lighting the candles on the altar. Madame Marguerite Rouffanche, the lone survivor of the massacre in the church, managed to escape by using the ladder to climb up to a broken window behind the altar, then leaping out of the window, which was 9 feet from the ground. Although hit by machine gun fire and wounded 4 times in the legs and once in the shoulder, she was able to crawl to the garden behind the presbytery where she hid among the rows of peas until she was rescued, 24 hours later, at 5 p.m. the next day, and taken to the hospital in Limoges where she was admitted under an assumed name. It took a full year for her to recover from her wounds. In 1953, she testified before a French military tribunal in Bordeaux about the massacre of the women and children in the church. We were speechless as we gazed at the destroyed living testament to the devestation which had fallen upon this community. It made me think of where my world would have been were it not for the sacrifices of those who fought during the world wars. A few days later we travelled to Belguim and saw the lines of the graves of the fallen. Sombre indeed but a reminder of just how many fought for our freedom! Here is my poem, based on what I saw at Oradour! and put an end to their lives. You can see here what it is about!